“So, when I had an opportunity to relocate, I didn’t hesitate for one second… and here I am.” So begins the story of many expats as they are told in the following pages. With the Internet’s increased accessibility, many blogs have been created and expats have embraced this new medium of communication in order to share their experience. Since 2011, BlogExpat.com is a public voice for many expat bloggers through regular interviews published on the website. This book offers a small number of them that we have selected for you and you must read this book as a photo album, allowing you to discover a world view, at a given angle. Living as an expat myself, I found quite a bit to relate to in this book. However, the stories selected did get rather repetative after a while. I'm familiar with the usual expat stories about moving abroad for love, career change or advancement. I'm also very famiiar with the headaches of bureaucracy and the advice of keeping an open mind wherever you go. 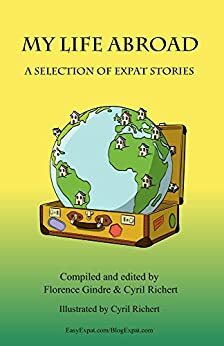 Most of the stories in this book repeated those ideas and simply changed the origin and destination of the expat telling the story. Even a novice at the expat life surely does not need the same points driven home over and over again through the course of ONE book. As similar as many expat stories can be, surely the editiors could have found a bit more variation in the many they had available to them when compiling this collection. I have enjoyed working with BlogExpat curating new interviews and helping tell stories from around the globe. Cyril took this straight-forward interviews and weaved them into a story line that tells the ups, downs and everything in between of living abroad. From Asia to Africa, Europe to South America, people's big move abroad (sometimes multiple) is documented in a unique and interesting way. This is more than an individual story. It is the story of us as people and the world we live in today.